Heads up for all team managers! Shift scheduling with the iPad™ can be so easy. Create and share beautiful shift plans with your team members in no time. Your team members will have all work times and the information they need right at their fingertips. 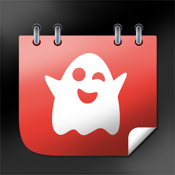 "Create sophisticated schedules with ease ... Dienstag is an excellent scheduling app ... It features a user-friendly layout that’s pleasing on the eye, and easy to operate ..."
"Dienstag is a must-have for employers looking for a little structure in the chaos of the business life." "Dienstag is an incredibly powerful scheduling app for iPad that has tons of features for employees and managers alike." • Continuous overview: Who, with whom and when? • Easily foresee staff shortages with the Absences Overview. Manage as many team members as you want – however the display of persons and shifts is optimized for teams of up to 20 individuals. 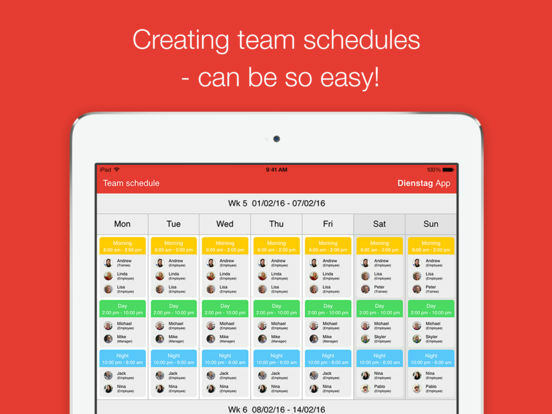 Dienstag – schedule your team is a user-friendly shift scheduling app for the iPad that can be used in a wide range of businesses and work sectors. With „Dienstag – schedule your team“, it's easy to schedule shifts and create readable work schedules for your employees in just a few steps. Even absences like vacation or illness can be easily managed and evaluated with „Dienstag - schedule your team“. Absences Overview: Easily foresee staff shortages with the new Absences Overview. The schedule can be sent to/ shared with the entire team. Each team member immediately has the latest work times and all the information they need right at their smartphone, tablet or computer. If you’ve ever created a schedule the old-fashioned way with pencil and paper you’ll know what a frustrating process that can be.